in Pain? Please Stop Reading This and CALL NOW! Have a good look at the pain assessment tool above (you may need to resize your window if you can not see it). It is a pretty standard tool used by health professionals to assess pain. However its use in Dentistry is fairly limited as pain and problems do not necessarily match up. Sometimes small problems can cause a huge amount of pain with the reverse also true - big problems are sometimes completely pain free. Cancer is the perfect example of this as most often it is completely pain free in its early stages and sometimes does not cause a 'problem' till you die from it. What this tool is useful for though is that it helps provide the dentist with some some sort of feedback with which to compare changes in your own pain status as a result of treatment or the lack thereof. Your managing dentist will need to have ACCURATE feedback regarding the level of pain you were in or are currently in to be able to best manage your condition. Patients tend to have a tendency to exaggerate the level of dental pain they are in which in turn leads to the managing dentist over diagnosing the actual condition and as a result get 'over' treatment which does increase your dental costs exponentially. If you are in pain, DO NOT ALLOW ANY TREATMENT TO OCCUR WITHOUT A PROPER SET OF EXAMINATIONS! At the very least, this will include visual and radiographic (eyes and x-rays) examinations with clear documentation of the issue at hand. If your pain is too great for you to concentrate on what the dentist is saying - simple - ask for an anaesthetic to numb up the pain so that you and the dentist can then concentrate on getting a proper diagnosis of the problem prior to jumping in with a drill bit rotating at 300,000+ RPM or a big set of pliers. ﻿​﻿​﻿﻿Small problems can be thought of as problems that are easy to diagnose and have a simple solution. These small holes in the teeth are a great example as they typically just need a small filling to fix. Some shallower ones might not even need a filling and can just be fissure sealed. The pain level associated with these small problems is variable and can be anywhere from no pain to quite severe pain. Small problems are unlikely to hit extreme levels of pain that some people may describe as the 'worst pain possible'. That sort of pain is usually the province of mid level problems and on occasion a sign of a big problem. Small problems will not kill you or your tooth in the short term. Left longer, they do tend to progress to mid level problems. ﻿Mid level problems are probably the most commonly encountered pain situation in dentistry. These problems are deceptive in that pain levels can vary across the whole scale and when on the low end, suggest to patients and practitioner alike that the problem is only a small problem, but when the pain is extreme, suggest that the problem must be a really big problem when really they are only a mid level problem. This is why a proper diagnosis of the situation is absolutely essential before jumping into treatment. Without this, it is impossible to accurately assess what the problem is based on solely on pain as it is too subjective. Mid level problems probably will not kill you but may kill your tooth in the short term. 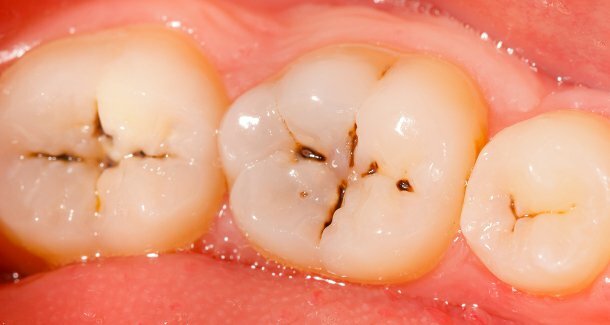 These metal fillings on the right often have been present for a long time and are almost always not bonded to the teeth. This puts the tooth at a much increased risk of fracture. Also, they quite often have significant decay below them that progresses slowly towards the nerve. 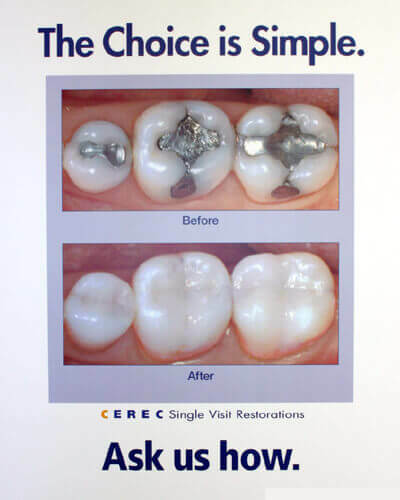 Prior to causing pain, they are quite readily fixed over just one visit using our CEREC technology. ﻿Big problems can be thought of as actual systemic health threats - in layman's terms, things that will either make you very sick or kill you. Big problems have quite often been present for a while (chronic silent conditions) but have not been diagnosed as they have not given people any 'problems' i.e. pain. Oral cancer as seen on this image on the left is a great example. Many people often do not take a holistic approach to dental management - there is a tendency to focus only on the problem at hand and not the patient as a whole and so these issues can easily be missed. Remember, most people (including sadly some dentists) only typically associate dental problems with pain. This is a very outdated management modality that really does end up costing more in your health and finances! Big problems can kill you, or can make you very sick and in a lot of pain.